–Paul Rudd in How Do You Know? A life well lived is one that involves discipline, reflection and the conscious awareness of our present actions on our future. It is quite easy in our day-to-day lives to enjoy instant gratification, after all, drive-thrus and fast food were created to appease such a desire, but is instant gratification something we should indulge? Upon hearing the quotations above over the past weekend, I began to mull over its validity. Could this be true? It is really as simple as making one small adjustment? 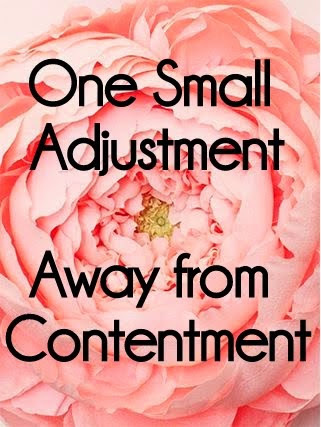 I think the key word is “small” and while many may say that the adjustments that are necessary in their lives to make it work are far from small, I would argue that we are giving these adjustments more power then they deserve. I would argue that it is we who are standing in the way and making it more difficult than it needs to be. I would argue that it truly is a small adjustment, a simple change of perception – focusing instead on the magnificent benefits that will be appreciated in the future, instead of clinging to the instant fulfillment at the moment which will evaporate in a matter of moments. If we can step back from the present situation that is giving us fits (savoring one more cookie even though we’ve vowed to watch our sugar intake, or purchasing another pair of fabulous shoes even though we know we can’t afford it), and act in a way as if we are parenting ourselves, looking out for our own well-being, making a prudent decision now that will be behoove us much more in the long run and reap far more abundance and lasting fulfillment down the road, then it really is a small adjustment. It is a matter of perception. Such a statement holds weighty truth that serves as a reminder that we all are the master of our destiny. We all have the potential of creating the life we covet. We all have the opportunities, however, we must accept that it requires a change within us, if we wish to see a change in our current situation. The small adjustment needed may be in your relationships, your health, your career, or something else entirely. But keep in mind that whether it be putting up firmer boundaries, becoming more disciplined with your saving habits, ignoring feelings of lust and choosing to get to know someone’s true character first, or by simply taking a risk by asking for a raise or seeking out advice, be sure you are tackling it from the direction of what needs to be changed by you, within you, for yourself because as we all know, we only have control over our own actions, and we must take responsibility for them if we wish to attain a contented and fulfilling life. I hope this post finds you well and may the week be off to a promising start. Thank you for stopping by and feel free to share your experience with this approach to life. I would love to hear your stories. I’m also intrigued by the Jennifer Aniston quote. I tried to make a career adjustment but learned today that it’s not going to happen so perhaps I should start trying in other areas! Don’t stop trying is one of my top mottos – you can seize a new opportunity if you believe in yourself and connect to people that can help you achieve it! I really, really, need this blog in french. I must say “Oh I love your texts and almost your beautiful photos” but it won’t be enought, I love the concept of this blog. I’m french, so, unfortunately it’s sometimes difficult to understand everything and it took a very long time to read it. Pease for the hapyness of the frenchies.. I think it is a small adjustment in attitude as well – and Jennifer Aniston’s quote gives me pause. I believe in high courage, but EVERYTHING you want requires it? Wonderful post, Shannon. Love both the first quote and the Jennifer Anniston quote … so thought provoking. Little steps can result in huge leaps of change in your life. You always seem to know when I am seeking some advice – these posts seemed to be timed just right. I am at a crossroads with my working life. I can’t call it a career because I am still trying to figure that out. My current job pays the bills and provides medical coverage for my daughter and me. I may have an opportunity for another position but for way less than what I am making now. Do I step out of my comfort zone and venture into a new and exciting territory that I must start from the bottom or do I stay at my current job (comfortable)and just pray I get a better pay increase compared to last year? Do I stay for mediocrity? One of my managers is leaving the company to become a VP for another company and she’s been providing me top notch advice. She has me thinking that it is nice to have options and to really list the pros/cons. She also suggested I do this on a whiteboard which I am really considering. Your blog has been quite an inspiration for me lately. I have been picking up after myself more and more. I also have been re-evaluating my closet and planning to pick up the classic items I should have and not just trendy things that will be outdated by Fall. I want to read great non-fiction again. I have accepted that I don’t need to be liked by everyone and no that doesn’t make me a “catty” woman. And most importantly, you are helping me realize the power I have to change my life with just one small step – a job interview with another company. Yes, I am keeping my family in mind and how this may impact them but I will think of myself first! I am so thankful I have stumbled upon your blog just by chance. That Jennifer Aniston quote is IT! No truer words have been spoken. We must challenge ourselves if we are to grow. It is the only way. Stretch and get uncomfortable that’s it! Very thoughtful post.I start by making a small adjustment.I go now drink a glass of water.